So after almost 6 months of intending to, I finally attempted beeswax wraps. Having only raided the bee hives a few time this year the supply of honey has been quite ‘exclusive’. Though this had not been my primary reason for venturing in; mostly it had been to inspect their progress, particularly after cyclone Debbie. Which may have been some 9 months ago now, however with the vegetation being ripped up, cut down or stripped as a result of the cyclone, there hadn’t been a lot of blossom, and therefore pollen for bees to feed on. 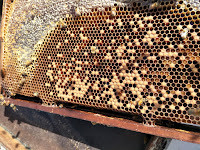 Many local apiarists (beekeepers) had resorted to their hives sugar water; only having the two hives and there not being too many around us, plus we hadn’t harvested prior to the event meant we didn’t have to do this. So we were fortunate (and it is a positive sign of a strong colony that) just four months on we were able to harvest some surplus, only 3.5kg but still. Followed by another 7-8 kg, three months on again. So whilst 10-12kg may not be a lot (given that a single hive may produce in excess of 50kg in a year) that was not the only product we extract. 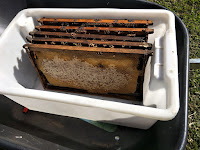 I apologise for the lack of images taken during bee keeping- only it takes one of us to entertain our toddler indoors or out of the way (just in case), whilst the other tends/raids the hive. Not that the bees are overly aggressive, but they are defending their home/queen/food supply; so this is just precautionary. 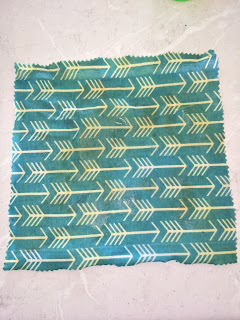 Sometime ago I purchased these wonderful versatile products- bees wax cotton wraps. They replace the need for cling film (or glad wrap, depending on where you are) for a lot of things; as they are mouldable, strong, water-resistant and re-usable… They’re not suitable for covering hot foods (as the heat melts the wax) or meat, but most other things (storing/covering/wrapping fruit, veg, garden produce, nuts, sandwiches, cheese, bread, crackers and fermented foods in your lunchbox, fridge or pantry…) they are fantastic! 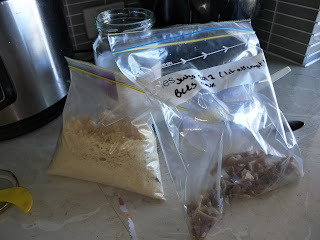 So I am not going to lecture about the use of plastic, as if you were to look in my fridge, freezer or pantry you would immediately note (amongst the recycled jars etc) are Tupperware containers, silicon moulds and plastic ziplock bags, along with a vac-pac kit. Predominantly these items are reusable, other than the latter which I am yet to find an equal alternative for meats… especially on the scale we produce it (a beast at a time), which I am not willing to lose to freezer burn or anything else or that matter. On the other hand we live by using the most of what we produce and reducing what we purchase, so the idea of making our own beeswax wraps is really no different. So according to commercial promos, depending on use and with good care they can last up to a year. My original (commercially purchased one) had lasted a fair bit onger than that. And once you’re finished their supposedly completely compostable (as their all natural product)… but better still now I know they can be re-waxed. Now most of what I have read suggested that whilst melting wax onto cotton would work, it can crack when chilled. So I used coconut oil in my mix to assist with pliability. Another addition often used (particularly in commercial ones) was pine tree rosin… this took some sourcing, especially for food grade. 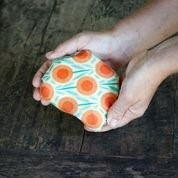 I suppose it isn’t a necessity, but it does provide that tackiness that helps when moulding to items, or itself. The rosin is also supposed to have anti-fungal properties; which is helpful, especially given that beeswax is supposedly antiseptic too. 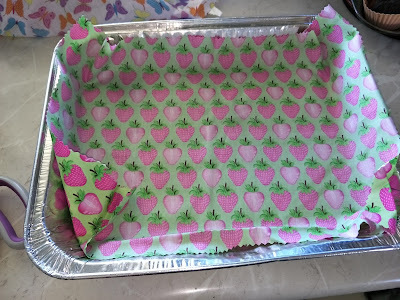 Now I had read a few posts about making these, some heat the ‘ingredients’ on a baking sheet in the oven, others use a double boiler method- combining the ‘ingredients’ in a “bowl” first; heated by sitting the “bowl” on top of pan of boiling water (much like heating chocolate). Either way I would not recommend using your best utensils or crockery when attempting any of these processes. In fact the bowl, tray and brush I used will be kept solely for this purpose. So how much beeswax do you need?- Some specified quantities for varying sizes, others were a little vague about how the shavings were spread. 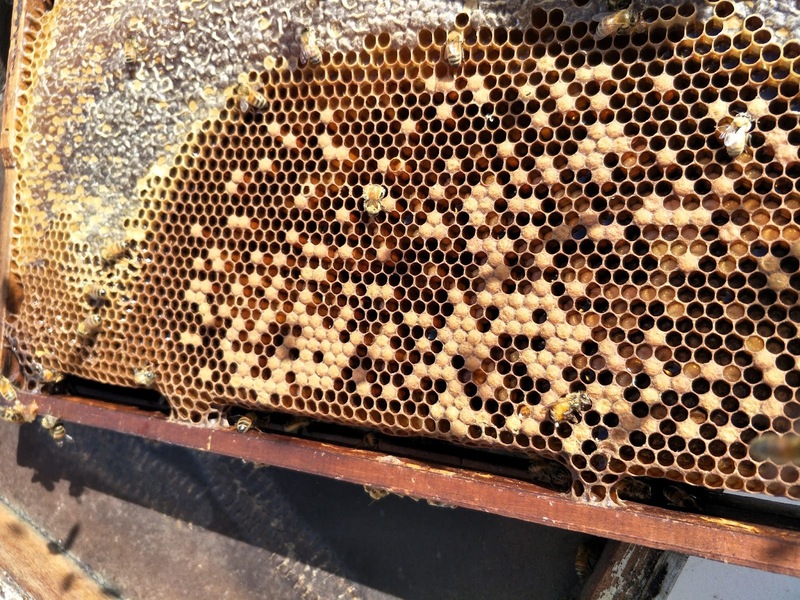 (e.g an 8"x"8 piece requires 2.5 tbsp of beeswax & rosin and 1 tbsp of oil.) 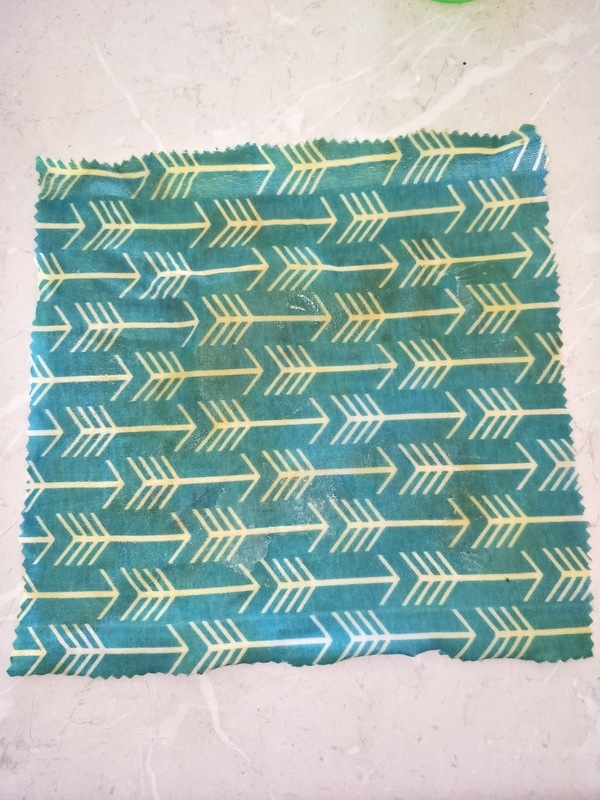 Personally I found this to be too much rosin, as it stained the cloth, was difficult to melt and made the resulting mixture quite (unnecessarily) thick. 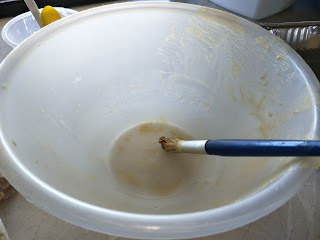 I must admit the idea of a double boiler seemed like more work to me, and dirtying (or destroying) additional equipment. 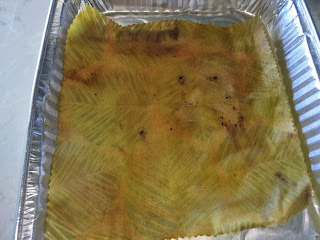 So I tried placing a piece of cotton on baking paper in a tray and then scattering wax pieces, rosin dust and drizzling coconut oil over it; then heating in an oven at 60⁰c. The result was not the best. The ‘ingredients’ appear to melt at different points, so the kitchen was a little smokey and the coverage was poor… and the pattern run and cotton even burnt a little. So I got over my laziness and attempted the double boiler method. 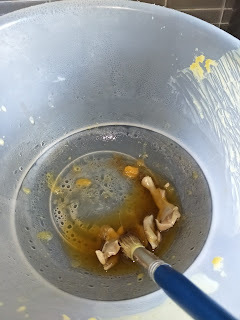 Again the ‘ingredients’ did melt at different points; so I would highly recommend melting your beeswax and oil together and then adding the rosin once the other ‘ingredients’ have melted. This seems far more effective. Otherwise the rosin clogs to the brush (or whatever you are using to mix) and not mix with in. This effort resulted in a claggy and uneven finish. So I combined both methods- omitting the baking paper which was burning by now. Most important point is that you are only trying to warm the mixture. So only put the oven on in between batches to maintain the heat- same for the hob. It was at this point I gauged my mixture as equal parts coconut oil and beeswax, then half the amount of rosin. 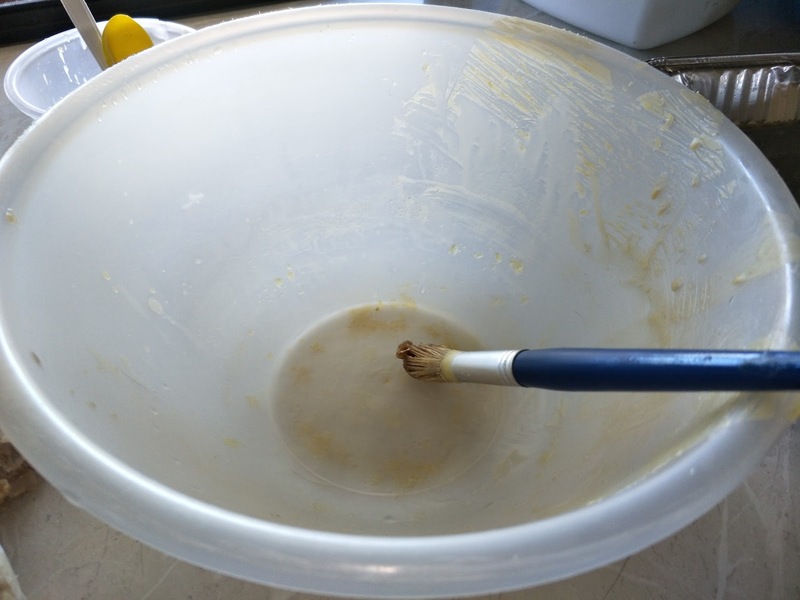 I then placed a prepared cotton piece in the tray, brush with the mixture over the bowl. Then place in the oven as necessary to keep melted. 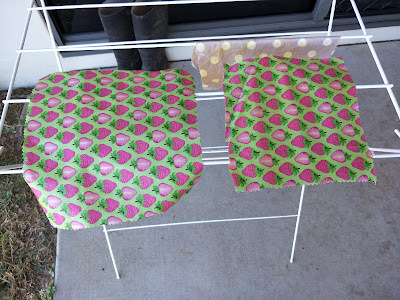 Repeat until all the cloth is covered, then peel when the mixture is wet (if solidified it will not peel evenly) and then place out to dry (which will not take long) and set. Once dry they are ready to use. 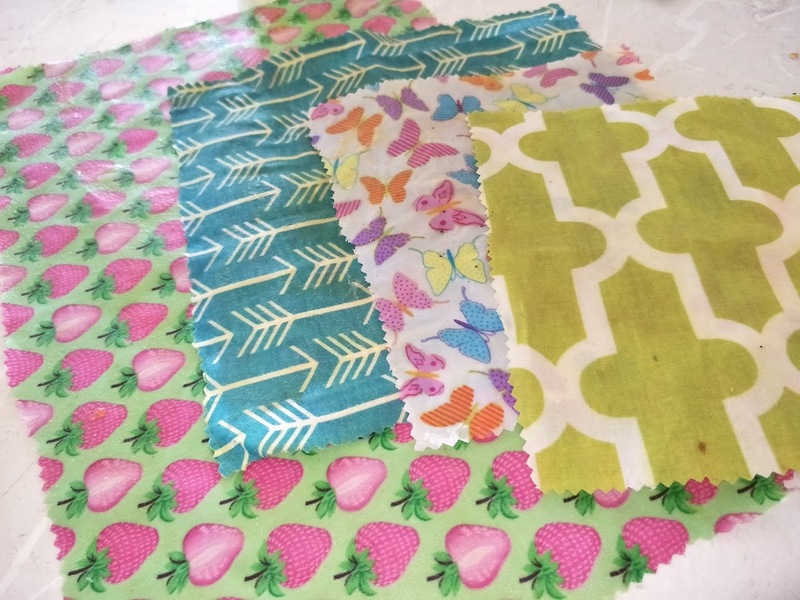 Whilst these may not be perfect, they’re not a bad start- I must admit bright colours look the best, though not if they have white patterns, as the mixture stains it. I'll get back to you on how much a piece needs when I have played with the quantities a little more. 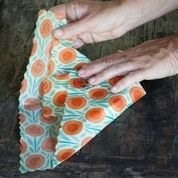 Simply mould the wrap to the top of the dish by using the warmth and pressure of your hands to create a seal. 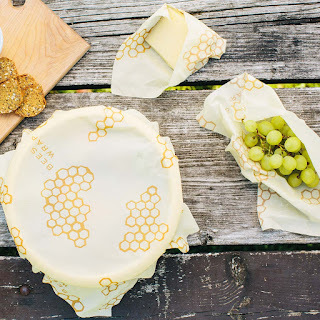 Or place item (here cheese) in the middle and wrap over and mould the ends back on itself. Wash using a mild detergent and cold water; you can pick off dried on foods or soak in cool water until it softens and washes away. 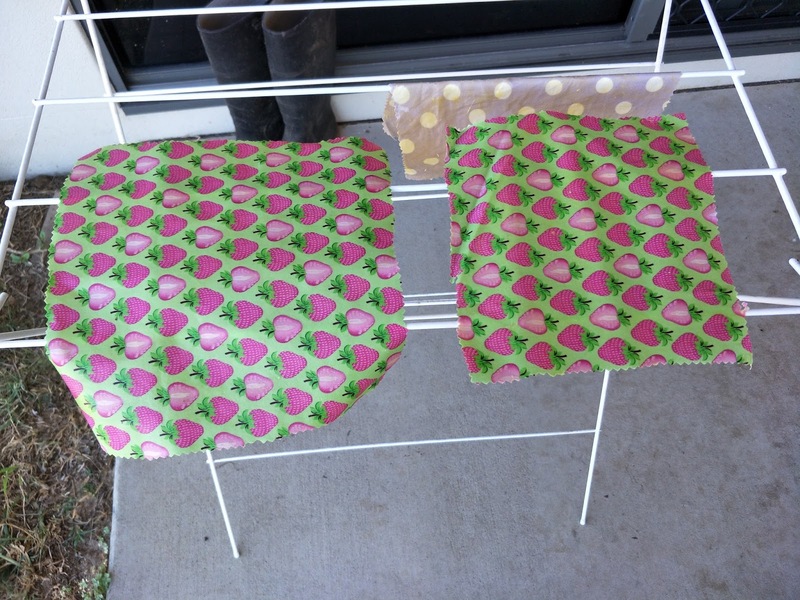 Once rinsed lay flat or on dish rack/ clothes horse to dry, then simply fold away and store til next use.